For the past week in December, Huang had been venting about his tortured ambivalence toward “Fresh Off the Boat,” the ABC sitcom based on the memoir he wrote about growing up as a child of Taiwanese immigrants in Orlando, Fla. He deployed his gift for pithy, wounding invective against the show’s producers and writers — before professing gratitude and love for the same people he just vilified. He described what he took to be the show’s falseness and insensitivity to nuance — before praising its first episode as the best sitcom pilot he had ever seen. He lamented the choice he had made to sell his life rights to a major network — before insisting that the premiere of “Fresh Off the Boat” on Feb. 4 would be a milestone, not just in the history of television but in the history of the United States. He had a point. “Fresh Off the Boat” would be the first network sitcom to star an Asian-American family in 20 years and only the third attempt by any major network in the history of the medium. Huang chose to sign with ABC in deference to the residual power of network television to alter mass perceptions about race, and he had hoped to portray the Asian-immigrant experience without equivocation or compromise. Huang, 32, was dressed in an acid-wash denim jacket and a black fur hat with its earflaps folded up, which lent his large, round baby face a not-at-all-coincidental resemblance to a certain East Asian dictator. (Huang likes to give himself nicknames — Kim Jong Trill, the Rotten Banana, the Human Panda, the Chinkstronaut — all of which, like the name of his show, repurpose and reclaim slurs and stereotypes.) He was sitting on the back fender of a Vice Media van, in which a five-man crew was preparing its equipment to shoot. We were waiting for two young female marijuana dealers whom Huang would be interviewing for “Huang’s World,” the gonzo food and travel show he hosts for Vice. The story Huang tells in his memoir is one of survival and struggle in a hostile environment — a prosperous neighborhood in Orlando. Though the picaresque book is written in Huang’s jaunty mash-up of hip-hop lingo and conspicuously learned references to American history and literature, it is also an extraordinarily raw account of an abused and bullied child who grows to inflict violence on others. The racism Huang encounters in Florida is not underhanded, implicit or subtle, as it often is for the many Asians from the professional classes living in and around the coastal cities where the American educated elite reside. It is open, overt and violent. Huang’s memoir records an unusual life trajectory: from tormented outsider, to angry adolescent who would twice be arrested on assault charges, to marijuana dealer, to high-end street-wear designer (under the “Hoodman” label, which eventually led to a lawsuit from Bergdorf Goodman), to corporate lawyer, to successful restaurateur. The book fixates on themes of pain and punishment. As a teenager, Huang was commanded by his father to kneel and bow to police officers after he was caught stealing from neighbors. Later, he would find himself surrounded by cops with guns drawn after he drove his car into a crowd of frat guys who were menacing him and several friends (after one of his own broke a window at their house). In Los Angeles later in December, while driving with Huang in his canary yellow Porsche Boxster to his Malibu apartment, I asked him what his parents thought of his portrayal of the abuse they inflicted on him. The book proposal for “Fresh Off the Boat” was sent to publishers not long after an excerpt from Amy Chua’s memoir, “Battle Hymn of the Tiger Mother,” appeared in The Wall Street Journal. The commercial prospects of Huang’s proposal were almost certainly enhanced by this coincidence: Chua’s book indirectly addressed the chief preoccupation of the American upper-middle class — getting their children into top-tier colleges — and therefore generated one of the infrequent moments in which Asian-­Americans aroused the fascination of the wider American public. Chua made Asian-Americans matter just long enough for Huang’s proposal to sell as a counternarrative to hers. This mixture of love and loathing toward parents will be familiar to generations of immigrants of every color, but Asian-Americans feel this tension with an unusual acuteness, in part because Confucian tradition is so explicitly directed toward the breaking of individual autonomy in favor of the demands of the family. This tension is compounded by the fact that, as a result of the federal Immigration and Nationality Act of 1965, which eased national-­origin quotas, Asians began arriving in the United States in large numbers just as the cultural upheaval of the 1960s was drastically loosening American manners and mores. Today the means that many Asian-Americans apply to achieve academic success (a narrow emphasis on rote memorization and test preparation) could not be more out of step with the attitudes and practices of the socially liberal elite that Asians aspire to join. The ensuing cultural dissonance generates an awkward silence around the topic of Asian-Americans — Asian-­Americans don’t want to portray their parents as backward, and white liberals don’t want to be seen as looking down on people of other races and cultures whose parenting practices seem primitive. Huang hates this silence. It is no paradox that Huang’s brazen attitude resembles nothing so much as that of his brash immigrant mother. As we arrived at his apartment in Malibu, Huang casually mentioned that his mother had on more than one occasion turned the wheel of her car sharply into oncoming traffic to terrorize her children into compliance. But Huang would later insist that he owes everything he has become to her. “Every morning, whether it was weekdays or weekends, she would get me up and start demanding: ‘What are you going to do with yourself today? What is the plan? What is the itinerary?’ ” Huang credits this with instilling in him the drive that made him relentless in his pursuit of success. In fact, his mother’s haranguing inadvertently helped jump-start his writing career. In 2010, his attempt at a second restaurant, Xiao Ye, received a zero-star review in The New York Times. The restaurant’s menu included facetiously racist items, including an “Everything but the Dog Meat Plate” and “Princeton Review Bean Paste Noodles.” In the write-up, Sam Sifton lamented that “if Mr. Huang spent even a third of the time cooking that he does writing funny blog posts and wry Twitter updates, posting hip-hop videos and responding to Internet friends, rivals, critics and customers, Xiao Ye might be one of the more interesting restaurants to open in New York City in the last few months.” Huang’s blog went viral when he published an email his mother sent him after the review came out. Huang’s utter lack of instinct for self-preservation has had the curious effect of preserving himself against any harm. While the established institutions he railed against had myriad vested interests to balance and secrets to hide, Huang has always taken the inherently sympathetic role of the only honest man, refusing to compromise with arbitrary or corrupt authority. This has made Huang a particularly good fit with Vice Media, whose food channel, Munchies, seeks to appeal to young hipsters turned off by bourgeois “foodie-ism” but interested in educating their palates. Tricked out in big sunglasses, high-top sneakers and flashy street wear, Huang’s on-screen persona often resembles an Asian Ali G — easy to mock, were it not a deliberate self-­caricature. Much of the pleasure of Huang’s Vice show comes from watching him slyly emerge from his buffoonish character to make incisive comments revealing an agile, literary mind — and then lapse back into the role of the pot-addled numbskull. I met Huang in Los Angeles during a time of high tension surrounding his show, a few weeks after he exploded in a Twitter tirade, accusing the network of neutering his book, and a week before shooting would wrap. 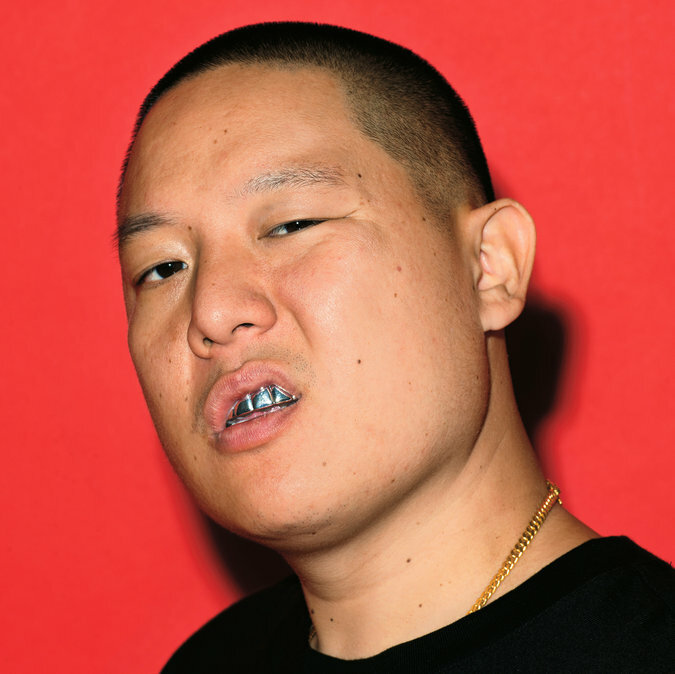 The executive producers were, at this point, careful to emphasize that the show was not a biography of Eddie Huang and his family. It was a loose adaptation “inspired” by, rather than “based” on, Huang’s book. The series borrows the setting and the characters but applies them to a plot that was invented almost entirely by a professional writing staff, led by the showrunner Nahnatchka Khan. Though Huang lived the life depicted in the show, 20th Century Fox Television (which produces the show for ABC) retains creative control over it. The business case for making an Asian-American show is simple: Asian-Americans are the fastest-growing ethnic group in the country, they earn and spend more than the average American and they are overrepresented in the advertiser-coveted 18-to-34-year-old demographic. But if the case were really so strong, surely two decades would not have passed without some network making a bid for this audience. Perhaps the reason is that the so-called Asian-American demographic (some 18 million viewers) is actually made up of many different nationalities with no common culture or language. Moreover, comedies about nonwhite people generally must navigate a trap-laden path between offending the group represented and neutering the comedy to avoid doing so. And they suffer from having to be approved and produced by people who are overwhelmingly white, and thus unfamiliar with the nuances of the stories they are telling, and also intensely wary of giving offense — but all this does is increase the likelihood that these shows will be dull, though still capable of offending their audience. This is exactly what happened to “All-American Girl,” the sitcom starring the comedian Margaret Cho and the last significant attempt to make an Asian-American TV show. The series was disowned by the Korean-American community that it tried to portray and was eventually rejected by the wider audience for being unfunny. It was canceled after just one season, two decades ago. “Fresh Off the Boat” was meant to be different. Not only is the production staff diverse, but the source material helps indemnify the show against criticism of many of its outlandish elements, which are rooted in Huang’s actual life. For example, the ferociously uninhibited and heavily accented mother portrayed in the series might appear to be an offensive caricature if it were a generic “Tiger mom” conjured out of thin air. In fact, Constance Wu, the actress who plays Jessica Huang on the show, told me that she underplays her character in relation to the actual woman. “I don’t actually think they would believe she was real,” Wu said. “That’s what reality television is for — to show you people who no one would actually believe were real.” To preserve the appearance of reality, the show has had to depart from it — while also claiming that same reality as its license to go as far as it does in presenting a raw slice of immigrant life. When Mar asked Khan to sketch out her vision for the show, she described what would become the opening scene of the series: a tight focus on someone in hip-hop garb that pulls out to reveal . . . a short, chubby Asian boy. The apparent incongruity (more apparent than real) is at once a joke for the prime-time network audience and a wedge that protects the series from recapitulating “model minority” representations of Asian-Americans. It is also the sore point that offends Huang more than any other aspect of the show. Huang especially took issue with the second episode in the series, in which a youthful Eddie develops a protosexual fascination with a blond, large-breasted trophy wife who has just moved into the neighborhood. It includes a scene in which Eddie fantasizes himself into a rap video. He “makes it rain” and squirts Capri Sun onto models. Though test audiences found the scene to be innocuously funny, Huang considered the thrust of the episode outright offensive. In his estimation, it denigrates hip-hop culture by portraying it as a vector for adopting sexist attitudes — a perversion of what, for him, had been a vital emotional outlet. His analysis is credible but, as the writers and producers told him, way too abstruse for anyone in the audience to think about. Even if Huang’s attraction to black culture is played for cheap laughs, to him it is an essential element of his person. It provides the missing half of the fully human entity that the Asian-American who consents to the model-minority myth has to relinquish. A model minority is a tractable, one-­dimensional simulacrum of a person, stripped of complexity, nuance, danger and sexuality — a person devoid of dramatic interest. Huang is something else: a person at war with all the constraints that would fetter him to anything less than an identity capacious enough to contain all his contradictions and ambivalence. As he thought about it, Huang hit on a comparison between Hollywood executives and the typical Chinatown restaurant. Each, he said, think they know what people want and strive to give them exactly that. But it never occurs to either of them to sell people the authentic thing itself — Chinese food the way Chinese people make it for themselves or, in the case of Hollywood, stories that don’t rely on formulaic contrivance to be funny. A new study goes beyond Amy Chua’s Battle Hymn of the Tiger Mother to examine the differences between Asian American and European American parenting (photo by Emran Kassim). The study by Stanford researchers Alyssa Fu and Hazel Markus explores how those differences impact the mother daughter relationship and the mother’s ability to motivate her child. Asian American children are encouraged to be dependent on their mother and mother’s are more directly involved in their children’s education, according to Fu. On the other hand, independence is emphasized more in European American culture. Children are encouraged to see themselves as separate from their moms and because of that researchers say their moms are less easily able to motivate their children academically. The authors also found Asian American children feel more pressure from their moms but that pressure didn’t decrease the support they felt their mothers gave them. It was just the opposite for European American children. The more pressure they felt from their mom, the less support they felt. Any pressures is perceived as negative by these children and are more likely to assert their independence. When thinking about their moms, Asian American children are more likely to want to complete a task even after failure. European Americans are more motivated when thinking about themselves. What is your experience with this? Would the results had been difference if they disaggregated data from the different Asian American subgroups? Share your thoughts. We’d love to hear them.